The vessel can carry over two hundred personnel, including sailors and troops from ship to shore and vice versa, in the eventuality of an amphibious warfare near the strategically important Strait of Malacca. New Delhi (Sputnik) — The Indian Navy has inducted the third ship of the Landing Craft Utility (LCU) Mk-IV project at Port Blair. 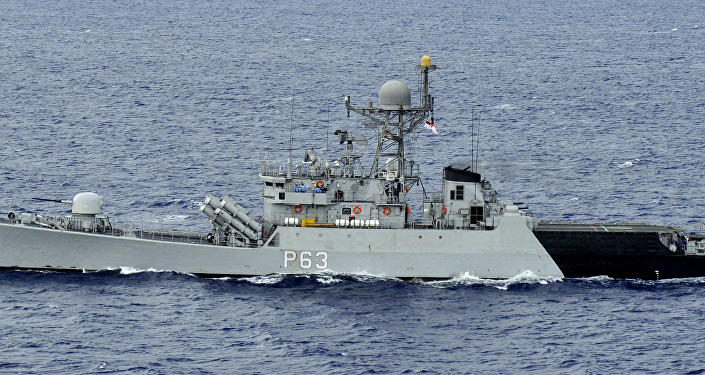 The ship was commissioned as INLCU L53 by Vice Admiral Bimal Verma, commander-in-chief, Andaman & Nicobar Command, of the Indian Armed Forces' tri-service command. The command oversees India's Andaman and Nicobar Island territories, including the strategic Strait of Malacca in the Indian Ocean. "LCU MK-IV ship is an amphibious ship with a displacement of 830 Tons and is capable of transporting combat equipment such as Main Battle Tanks Arjun, T72, and other Armored Vehicles. The ship is fitted with state-of-the-art equipment and advanced systems such as the Integrated Bridge System (IBS) and the Integrated Platform Management System (IPMS). The indigenous CRN 91 Gun with Stabilised Optronic Pedestal provides the ship the requisite offensive capability for undertaking patrolling in addition," the Indian defense ministry said in a statement. Besides carrying 145 tons of military equipment in addition to 160 troops, the (LCU) Mk-IV vessel can sail through the sea at a speed of 15kt. It will help the Indian Navy in carrying out multi-role activities, such as beaching operations, humanitarian assistance and disaster relief, search/rescue, and supply and replenishment of distant islands. "The remaining five ships of the project are in an advanced stage of construction and are scheduled to be inducted into Indian Navy over the next year and a half," the defense ministry added. The first LCU of this class was commissioned in March 2017. For the last two years, India has massively enhanced its naval capabilities at the Andaman and Nicobar Command. "These islands allow a navy to cover the key waterway facilitating trade between East and Southeast Asian countries with Europe, Africa, and the Middle East. As the main entry point into the Indian Ocean from the western Pacific, these islands could provide India with unparalleled advantages as Beijing expands its presence in the Indian Ocean," Darshana Baruah, a research analyst at Carnegie India noted in a paper published in the Asia Maritime Transparency Initiative. Apart from the three LCUs, a floating dock for warships and one P-8i (submarine killer aircraft) are also deployed by the command to keep an eye on China's naval movement. India's state-owned Defense Research and Development Organization (DRDO) is also setting up a land-based long-range missile facility on Andaman's Rutland Island, which is approximately 200 kilometers from the Strait of Malacca.